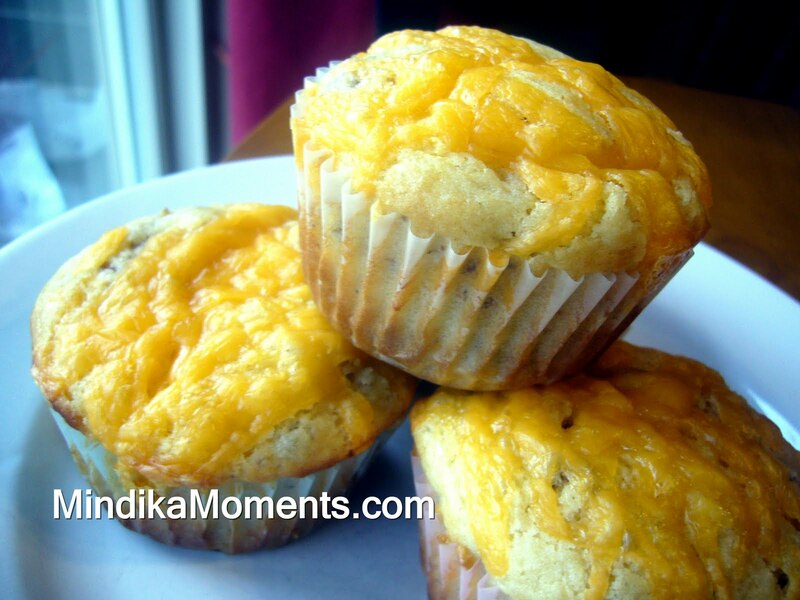 Mindika Moments: Need breakfast in a hurry? Need breakfast in a hurry? I'm probably crazy, but every time I'm asked to bring food to a party, dinner, activity etc...Instead of choosing to make something I'm familiar with, you know a tried and true recipe...I choose to experiment, to try something new. This inevitably stresses me out, and under the pressure it doesn't' always go the way I plan. I mean as good of a cook as I think I am...I'm still human and I still bomb in the kitchen more times than I care to admit. Well, actually I really don't mind admitting it, after all the path to success is riddled with failure. That being said...there are those occasional brilliant moments when my experimentation's, even under pressure, actually work and a new favorite recipe is born. This is one of those recipes. 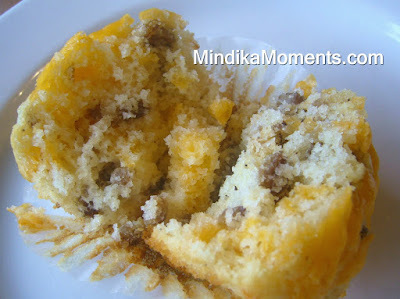 I was asked to bring muffins to our church activity last Saturday and I had an idea to create a savory/sweet breakfast muffin to satisfy any variety of morning cravings. On my first try the Maple Sausage Cheddar Breakfast Muffin's were born. I hope you like them as much as we did. They're great for brunch, or on the go breakfasts. I even made a batch to freeze, so on those crazy mornings when my husband is running late for work, he can grab a couple, nuke them and eat on the road. Several people commented that they tasted a lot like a McDonald's McGriddle sandwich! Give them a try and let me know what your family thinks. 2. In a large mixing bowl combine the flour, baking powder, salt and sugar. 3. In a smaller bowl combine the maple syrup, beaten egg, milk and oil. Mix well. 4. Add the wet ingredients to the flour mixture stirring lightly until moistened, but do not over mix. The batter should be lumpy. 5. Fold in 1 cup of the cheese and the sausage. 6. Pour the batter into paper lined muffin tins, filling about ¾ full. 7. Top each muffin with additional cheese. 8. Bake for 8-20 minutes. *The sausage in this recipe could also be substituted with bacon if you prefer. Seriously they are so good. Dave was ticked he didn't try one. What a clever idea! I love the maple/sausage combination. I'm not surprised they were a hit! Wow, if it tasted like the Mcd's McGriddle sandwich I'm in! I'm loving the idea that it's easy to take on the go.